Solbit’s Argentinian find: bathroom humor! I’m am so sad today. We have begun our trip from South America back to the US. We’re waiting at the Trelew airport for a flight. Trelew is in Patagonia. Papa is in the Men’s room. He went there to get away from my whining again and again, “I want to stay here!” Even after our wonderful seven months living in Ecuador, Peru, and Argentina, I’m not yet ready to go home. Papa just came back from the Men’s Room. He saw me still pouting to Nona, but he returned anyway. Right away, he found a way to cheer me up with some bathroom humor. “Solbit, you have to look at this photo that I just took in the restroom,” he said enthusiastically. “Papa, I’m not sure that would be appropriate,” I replied, even before Nona could close her dropped, disapproving jaw. “Don’t worry,” he said, “I didn’t go low with my iPhone camera. You’ll appreciate this and so will Nona. Nona, close you mouth and look here.” Then he exposed his big iPhone 6 screen for us to see. “This is what I saw when I was standing in the bathroom and turned my head,” Papa explained. Papa said he felt like “The Eyes of Trelew” were upon him, just when he needed his privacy! “For just a fraction of a second, I thought a woman was staring at me through her sunglasses, and then I started to laugh, because I realized I’d been fooled,” Papa laughed, and we did too. “That is funny!” Nona exclaimed, “I wonder if there’s one in the women’s restroom?” She and I checked. There was! 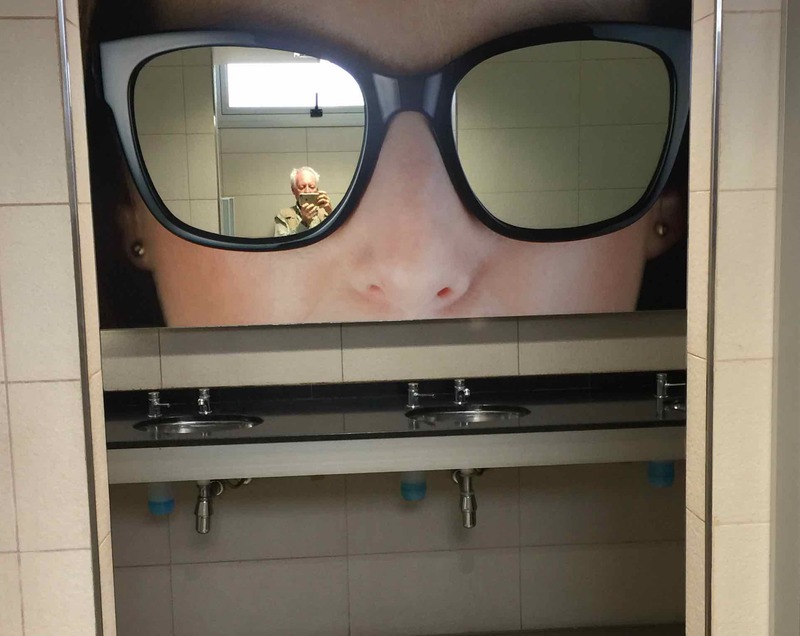 That one is a big mirror made to look like a man’s sunglasses though. Nona and I laughed again, and I almost forgot to be sad. Papa said that the mirrors in the Men’s and Women’s rooms weren’t just “bathroom humor” but also art. “Art?” I questioned, “in a bathroom? I don’t think so.” Nona jumped in, “Oh, sure, art can be found almost anywhere. 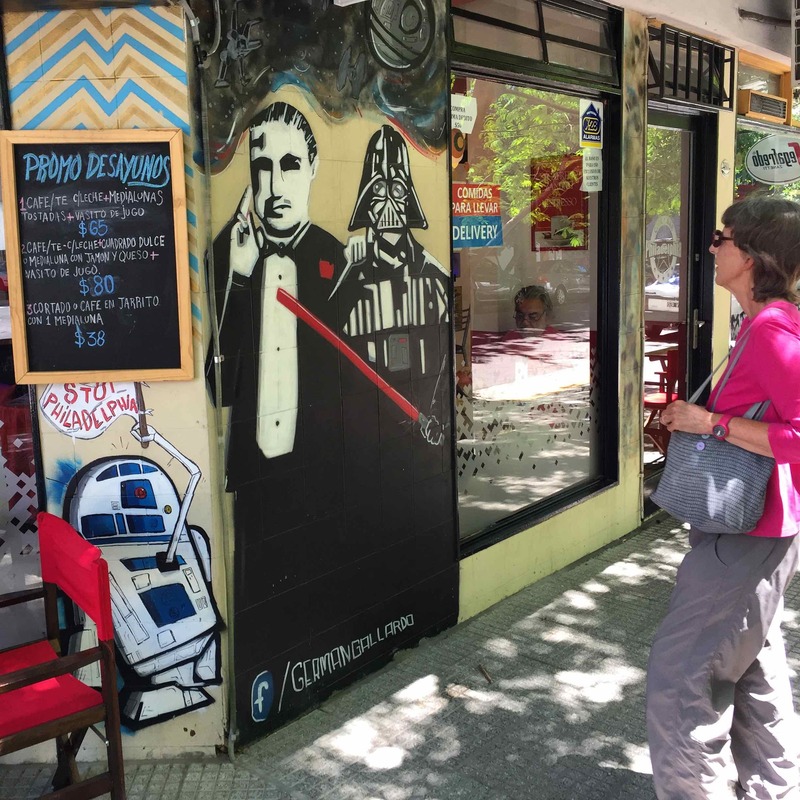 Remember the mural outside of that pizza shop in Buenos Aires, Solbit?” I did remember that painting of movie characters. Check this out. Right there at the pizza shop was Don Corleone and Darth Vader. Wonder if either of them liked pizza? Does Darth Vader eat or is he just a machine now? Oops, our plane is here. We have to put the computer away and board. I’ll have to finish this email another day. Stay tuned…..
Our art appreciation continued when we arrived at our next stop, Washington, DC. Nona and Papa took me to the Phillips Collection — they collect art there. 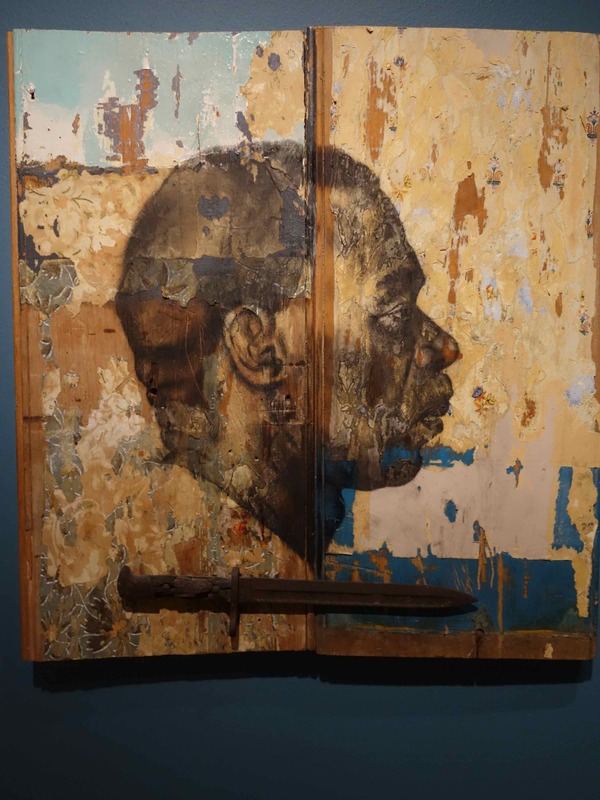 We saw this amazingly detailed portrait called, “Mercy,” by Whitfield Lovell. A fine portrait doesn’t need to be in oil paint on canvas. This dignified image of a man who was made a slave is in charcoal and on wood. I guess art can be found in many different places and can be created out of many different things. For another example, look at this. Papa said he thought it was oil paint on canvas, and he’s right. 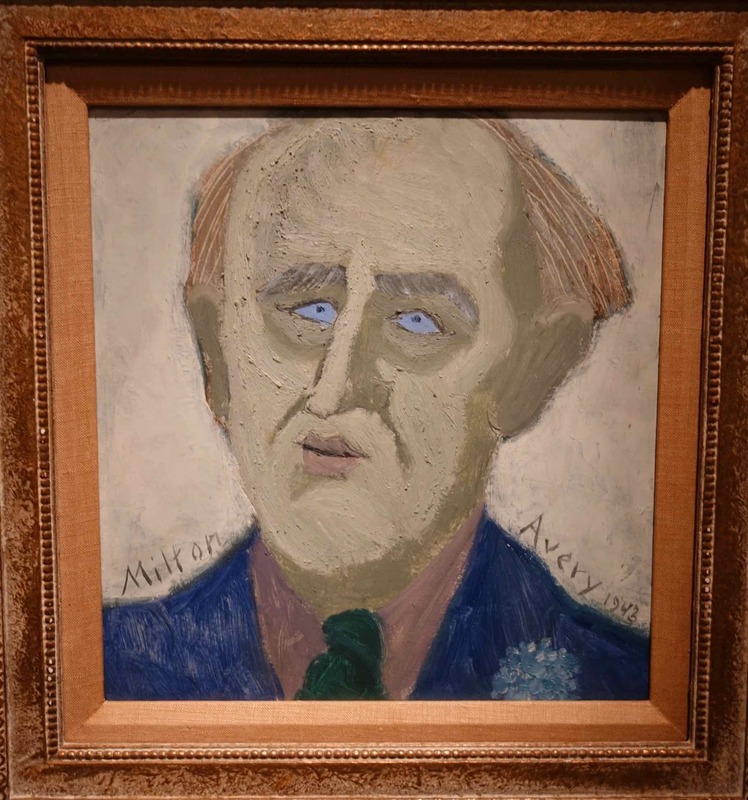 Nona really liked this oil on canvas portrait of Marsden Hartley by Milton Avery. I don’t have canvas or oil paint, but, hey, I have a ball point pen and crayons. Maybe I’ll try being an artist! Well, as you can tell, we’re back in the USA. Although I’m sad to have left South America, I’m pretty happy eating great food at Uncle Tom & Aunt Barbara’s home on Capitol Hill, and we can just walk to the free Smithsonian museums on the mall here to see more art. It’s not South America, and I do miss hearing Spanish, but I can’t complain. Bye! Being small, I notice things that bigger creatures usually miss. What bigger creatures? Well, Nona and Papa serve as two examples. Sometimes they need help — my help — to see the smaller things in life. In my opinion, seeing the smaller things in life is very much underrated. Most people seem to want to just see the bigger things in life, see the bigger picture, see the grand plan. That’s ok, I suppose, but, as a tiny creature, I can point out what they’re missing in life. Oh, I forgot to mention that we’re in Bahia Bustamante on the coast of Patagonia. Our lodge is so remote that it has no phone service, no internet, and no electricity, except in the evening when they start up a gasoline powered generator from 7 to midnight. Now, back to my story about small is beautiful. We went for a group walk with our excellent guides, Nicholas and Ignacio, to a special place. It’s special because it has the remains of a forest where the fallen trunks and branches of huge trees have turned to stone. 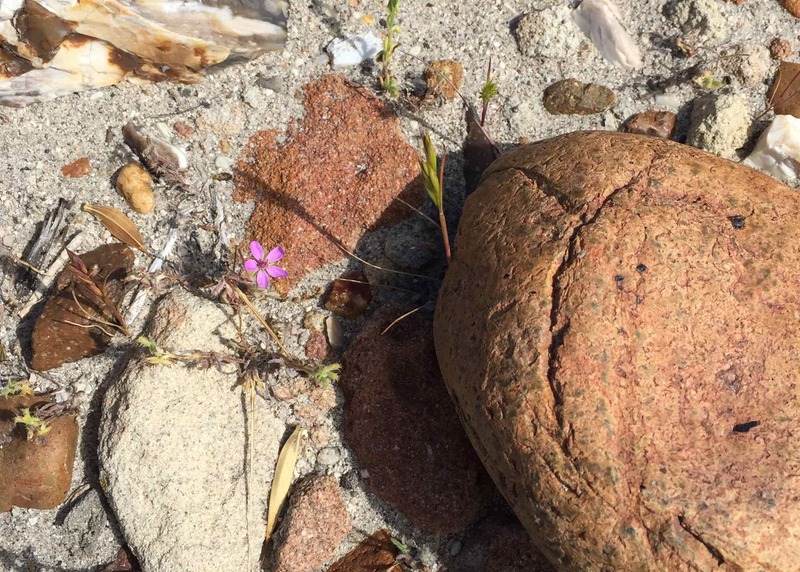 So, while everyone else focused on looking at big stone logs —now don’t get me wrong; those were interesting — I focused on finding small things, and Nicolas helped me. 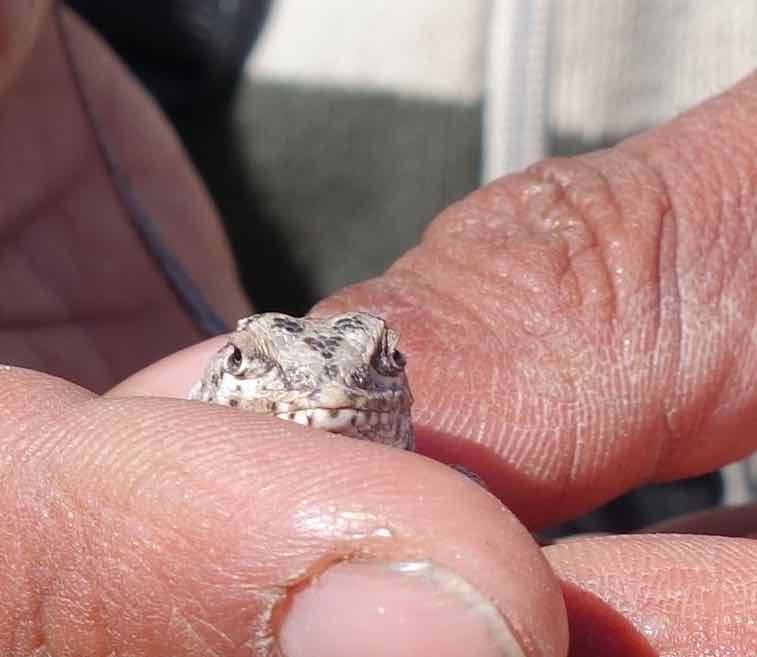 This very small lizard was bigger than I am, so Nicolas had to hold him, while I took a look. Nice face, huh? I easily saw this small gem, but Nona and Papa had to put on their old peoples’ eye glasses to see it. Once she saw it, Nona agreed this was worth a photo shoot. Nona picked this photo out of the many she took of this little pink flower. I think her photography is getting better with practice. Being an open minded creature, I was willing to look at some big things, too. I have to admit that, on first look at this big thing, I thought I was looking at a piece of a fallen tree. Wrong. It’s petrified wood. Stone. Minerals have replaced the wood in a way that makes the stone look like wood! Tall trees don’t grow in this part of Patagonia and haven’t for eons of time. So, the petrified forest tells us what an ancient forest looked like, and, also, that the climate here used to be very, very different than it is at present. Now big trees can’t grow here, but way back in ancient times trees grew all over this place. 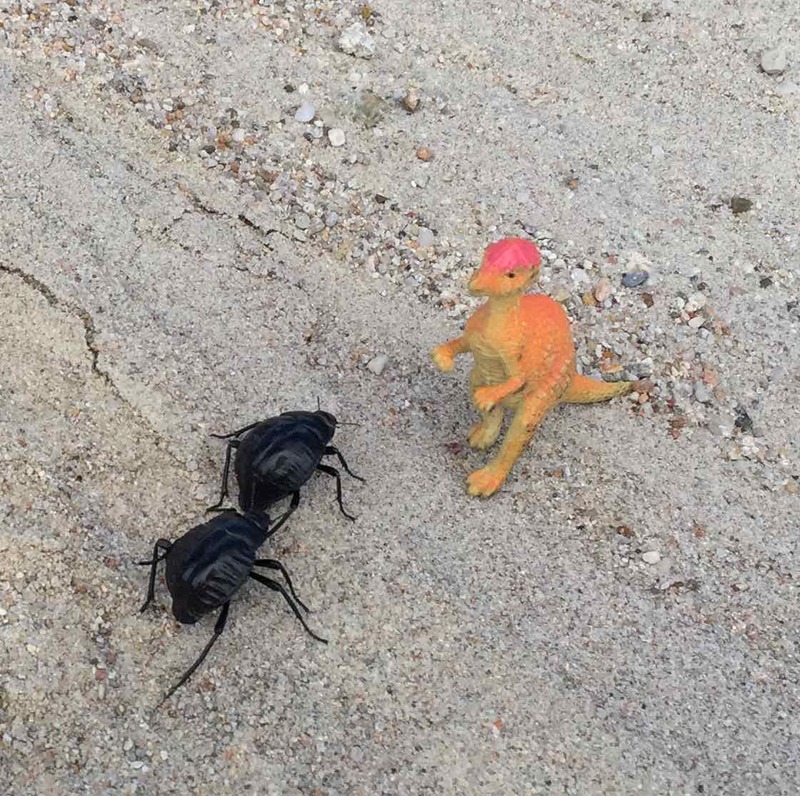 I turned around and almost bumped into these two small things. Nona needed no push to photograph these two. She was on them with her camera in a second. Didn’t need her old person’s glasses, either. In addition to small things, I enjoy pointing out rarely seen things to Nona and Papa. 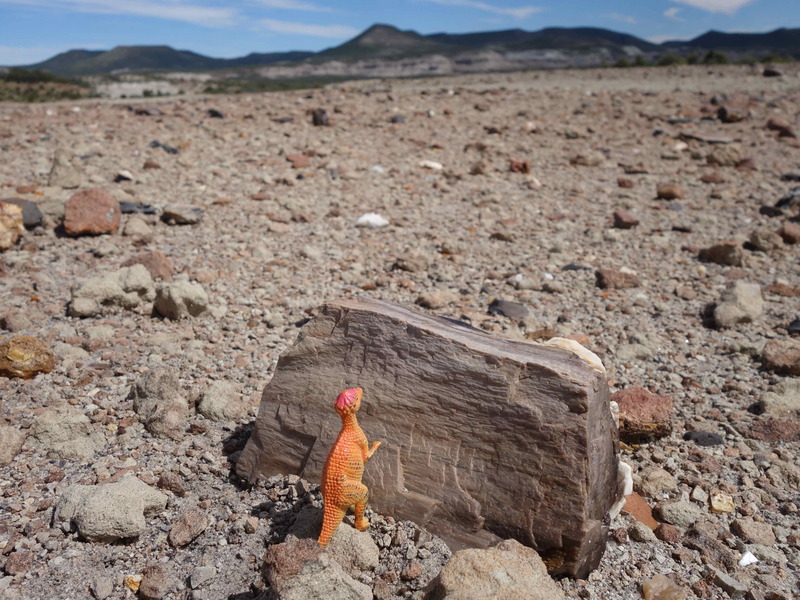 So, when I saw this foot print, I said, “Well, I think this must be the first real iguanodon footprint that we’ve ever seen!” I mean, I was excited to think that I might actually see one of my own kind in the flesh, right here in Patagonia. No such luck. 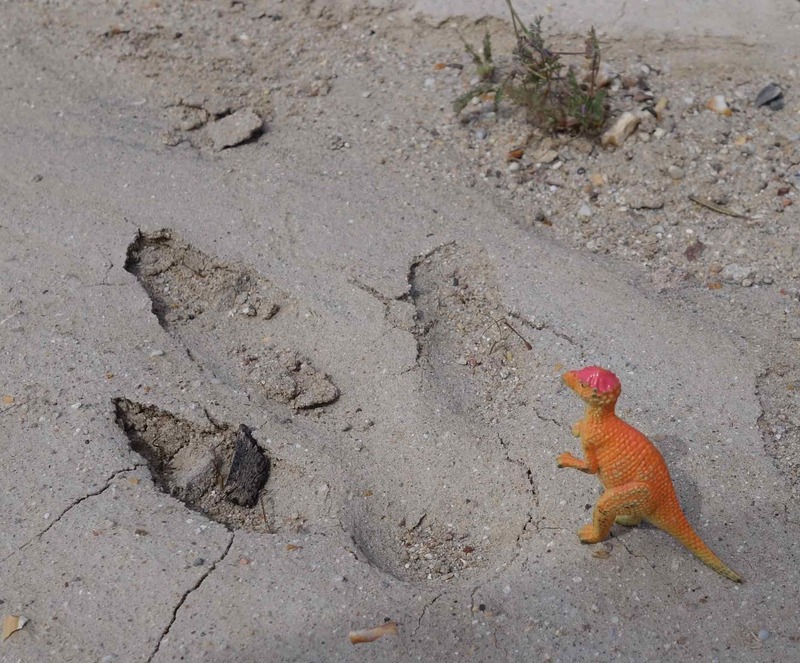 Turns out, this footprint was made by something called a “lesser rhea” – a bird – not an iguanodon. Bummer! On the other hand, later we saw a “lesser rhea,” and what a sight that was. It looks like a big bird on stilts wearing a large, feathery tutu. Papa said that it looks like another bird, an ostrich. You won’t see lesser rheas in North America, except maybe at a zoo. They like the freedom to run wild in the wide open spaces of Patagonia. I do too. Oh, girl, I think I’m going to be sad. I’m usually pretty upbeat and happy. So what’s my problem? My problem is that it’s almost over. Nona and Papa told me this morning that, in just a few days, our 7+ months in South America will come to an end. (I’ve got tears in my eyes as I wrote that last sentence.) We still have Bahia Bustamante here in Patagonia to look forward to. I’m going to make sure to enjoy that. While we’re still here in Trelew — that’s an old town started by immigrants from Wales — we like walking by a pond near our hotel. We see birds. One really surprised me. Well, no surprise there. That’s not what surprised me. Just a little while later my surprise came along. That bird had fooled me, but I think it also fooled Papa for just a moment, but I’m not going to embarrass Papa by pointing that out. I’ll let him think he’s smarter than … well, smarter than he really is. Although, I have to say that he is pretty smart. 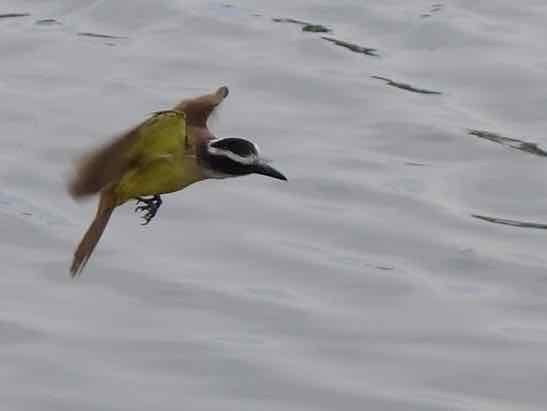 I thought the Great Kiskidee was hovering because it was looking for something. So, I yelled, “Hey, what are you looking for?” That was my mistake. The moment the Kiskidee heard my squeaky voice, it stopped hovering and took off so fast that I could hardly see it. I’m pretty sure it had been looking for food. Birds spend a lot of time looking for things to eat. They seem to be eating all the time. Not like us. We just eat once or twice a day. I think Papa might like to eat more often, but Nona keeps a lid on that. 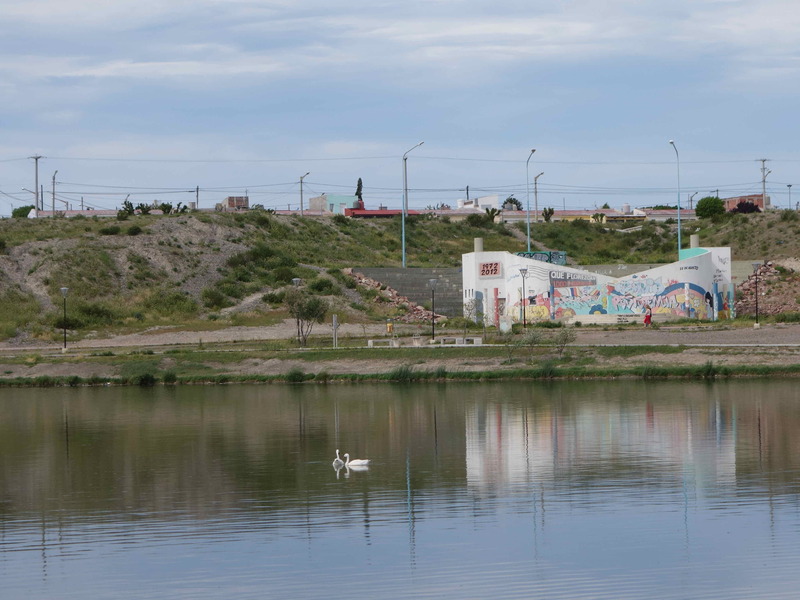 The swans are so graceful and beautiful that I think the people of Trelew are really lucky to have them here. “Oh, look over there,” Papa called to us. There’s another old friend of ours, but I always like seeing them.” I recognized the bird right away. 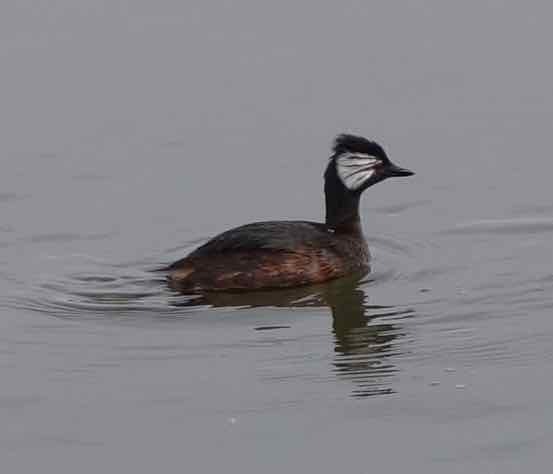 The white tufted grebe came over to say hello to us. 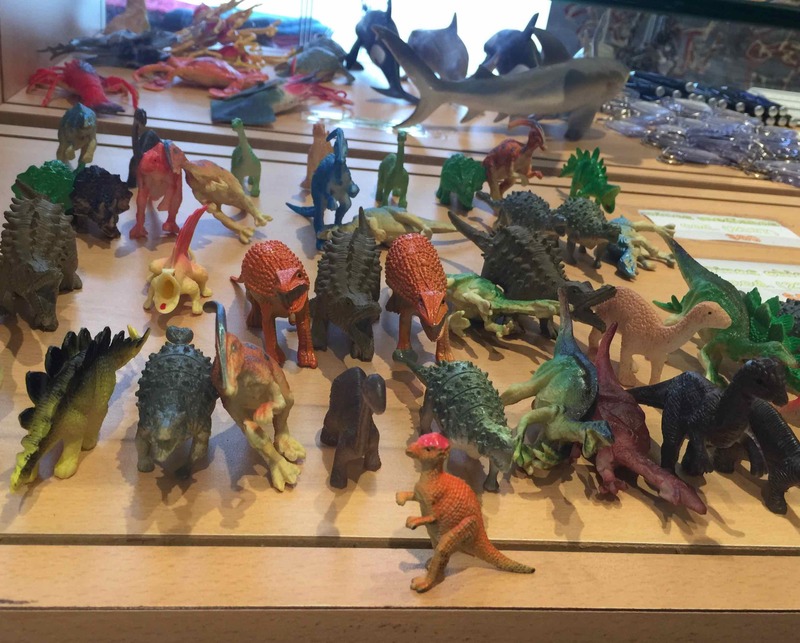 It’s pretty confident around human beings … and a plastic Jurassic, too. Well, walking around the pond and watching birds sort of perked me up. I almost forgot to be sad about our pending departure from South America. I need to remember to go for walks and go looking for birds next time I’m feeling down in the dumps, or anxious, or worried, or bored. I just feel so much better when I do that, don’t you? Hey, you know how Papa is always teaching me new words, right? Well, I just learned a new word, and it is long: “Paleontology.” I’m still learning about it, but the word means something like the study of ancient life, going way back to 3,800 million years ago! Wow! That is old; I mean ancient! If you study ancient life — that’s what “paleontologists” do — you get to see some really cool things. The paleontologists even let us ordinary people (and a plastic jurassic) see those cool things, too. You just have to go to a paleontology museum. That’s what we did here in Trelew in Patagonia. Look at this. 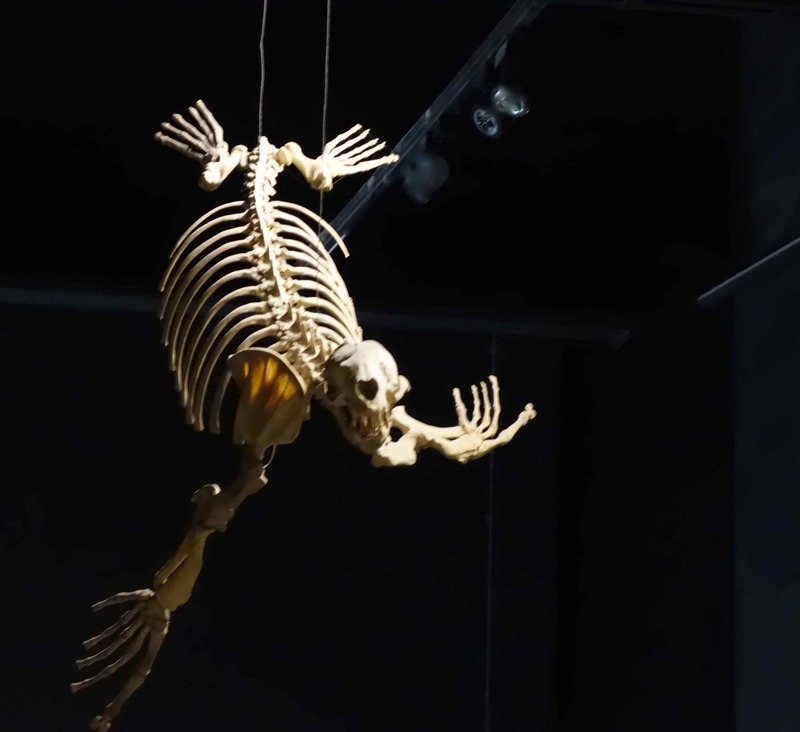 This skeleton belonged to a big sea creature that lived before any human beings existed. 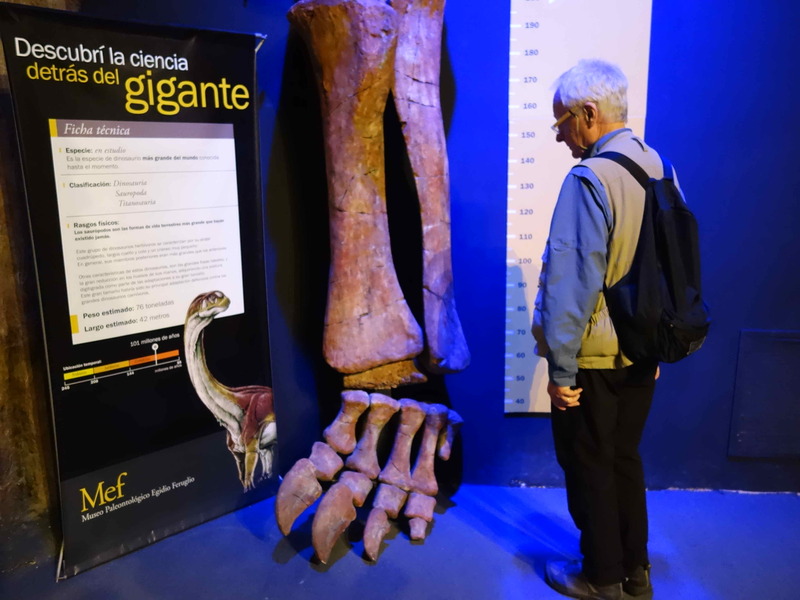 We went to the Egidio Feruglio Museum of Paleontology. Some scientists must have spent a lot of time searching for all those bones. Imagine how much time it would take to figure out which bone goes where? I’m tired just thinking about it. Apparently, some people enjoy that kind of thing. Papa and I found something we enjoyed at the museum. We compared ourselves to a very large dinosaur. Of course, I wanted to compare myself to that leg too, but I wasn’t tall enough. 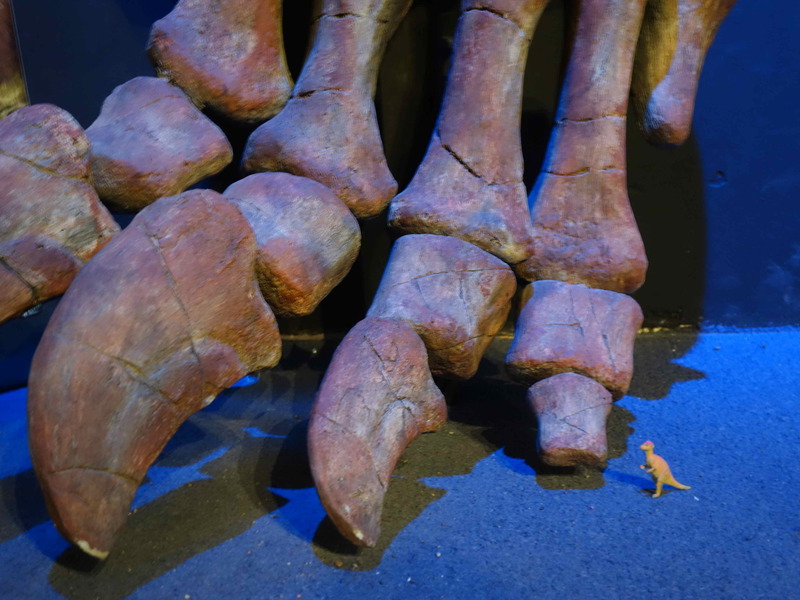 I’m barely as tall as that dino’s toe! We had a laugh about that. Who would think that going to something called a Paleontology Museum would get me and Papa to laugh? What a surprise! Oh, I got another surprise, a really good one too, when we went into the museum’s gift shop. It was as though the gift shop folks knew that Nona and Papa were bringing me to their museum. I couldn’t believe my eyes when Nona called to me, “Solbit, come here. 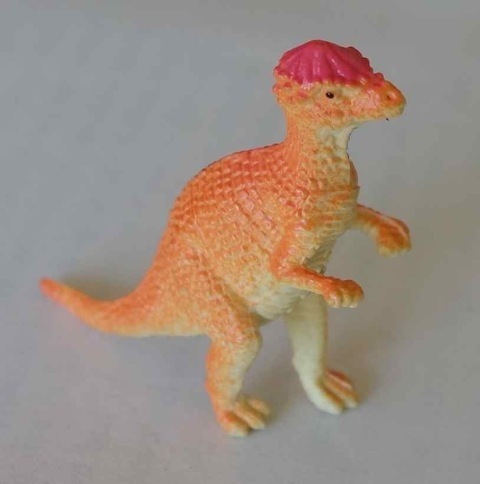 Look who’s here to greet you.” There were all my fellow plastic jurassic friends. 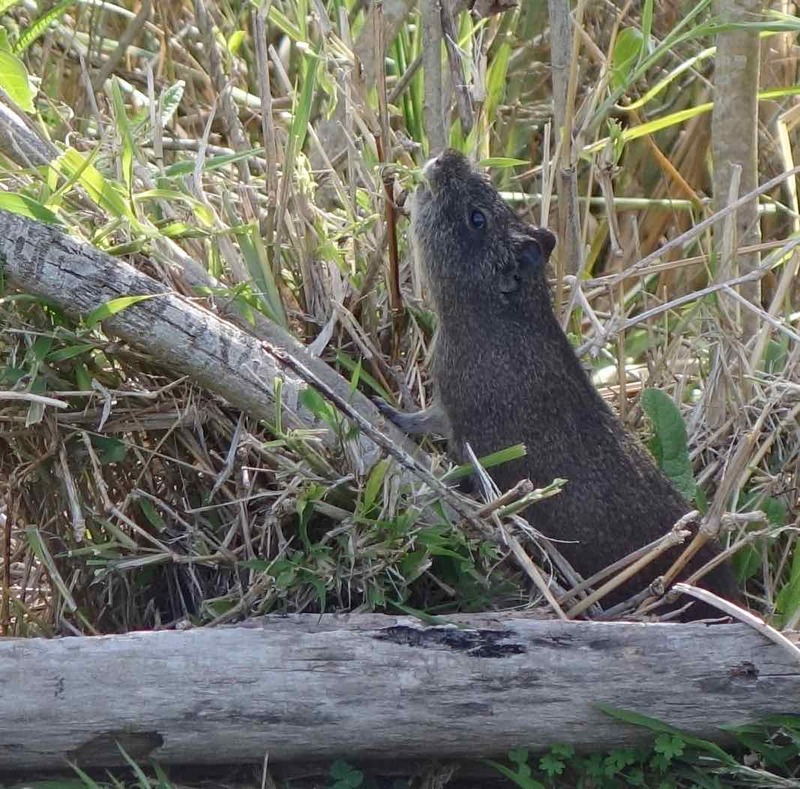 Who knew I’d bump into them here in Patagonia. Life sure is full of happy surprises if you look for them, even in the most unlikely places. Papa says we’re going to look for some more surprises at a town pond not far from here. I’ll let you know if we find what we’re looking for. Bye! I’m your friend. October in South America means that spring has sprung! 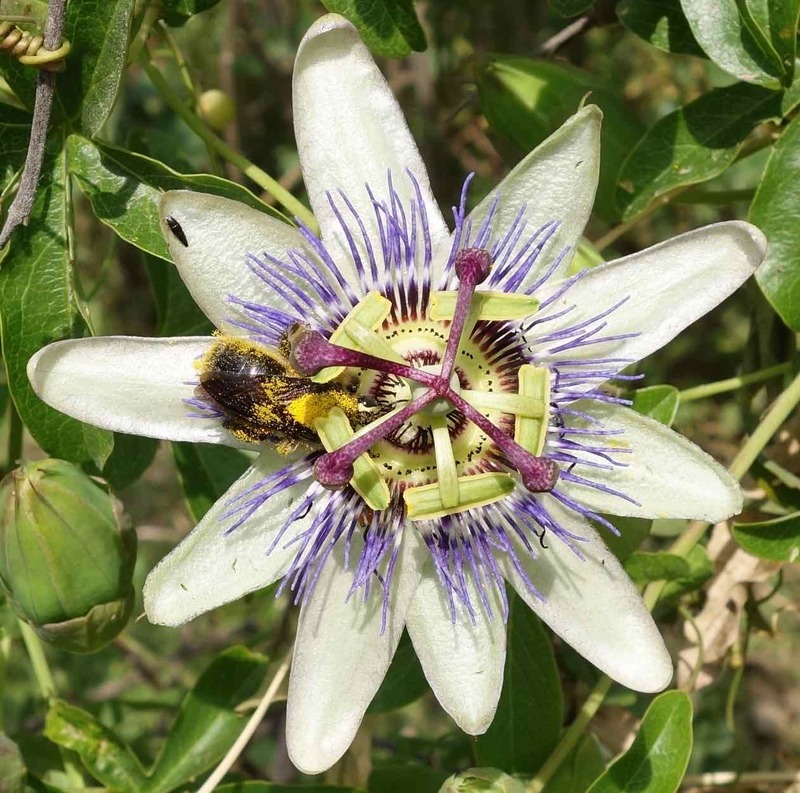 I look forward to our walks to the ecological reserve — called “Costanera Sur.” The bees are buzzing. The flowers, bushes, and trees are blooming, and the birds fly around with construction materials for their nests. Uncle Josh saw our photo of this flower and told us the name, “passion flower.” I enjoy its design, and so does that bee. Papa explained that the bees help flowers (and other plants too) to reproduce. He said that flowers try to attract bees by looking good. The bees stop by the flower for a visit, pick up tiny grains of pollen on their fuzzy hairs, then fly to another flower and give that flower the pollen, and then, with the pollen, the flower can make new seeds. What a miracle! Who figured that out? Nona says that, if I want an answer to my question, then I need to learn about something called evolution and a guy named Darwin. Gosh, there’s a lot to learn, isn’t there? Don’t you feel like the more you learn, the more you want to learn? I do. Discovering all these new things just makes the whole world more wonderful to me. Nona said in a loud whisper, “Solbit, look! There’s a ‘salt tatter.’” I looked for a potato with salt on it, but I didn’t see any plates with potatoes or cartons with french fries . “All I see is that bird,” I replied. Well, I misunderstood what Nona had said. 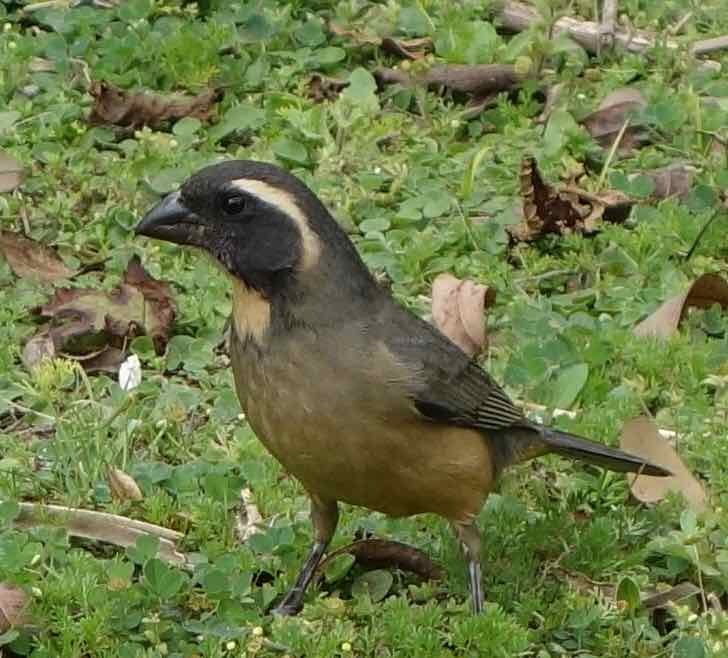 She said “Saltator.” That’s a bird, a golden-billed saltator. 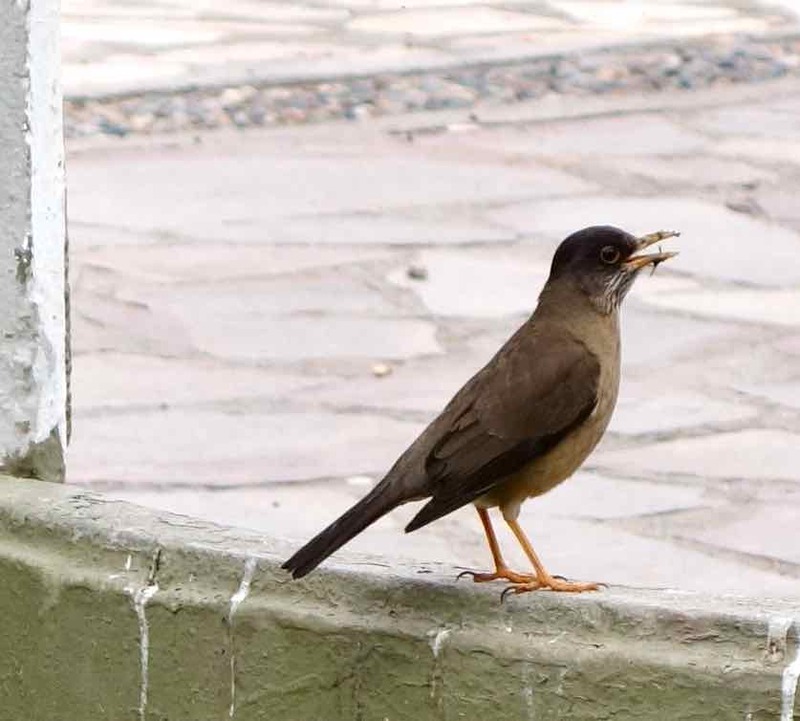 I joked, “Saltator? Who comes up with these confusing bird names?” Nona, took me seriously. She said, “Well, Solbit, if you want an answer to your question, you’ll have to go to the Audubon Society’s website to learn about how birds are named.” I like learning, but I don’t know if I like it that much. Why can’t she just tell me? By the way, I should have said that I really liked seeing that bird with its golden-bill. We see other animals too. For example, I really liked seeing this one on the ground. Hey, you’ve seen ladybugs, right? They’re little round, domed bugs with a black face and an orange body with little black dots. Talk about cute! Girl, lady bugs make me smile every time I see one. 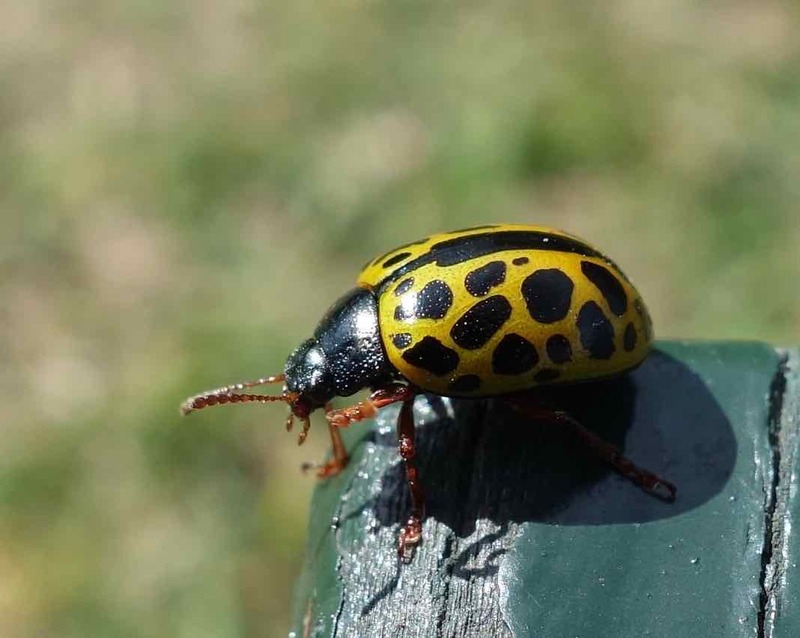 This bug reminded me of a ladybug, but it’s the wrong color and just a bit too big. The color reminds me of lemonade. If you know what this bug is, please don’t tell me to look it up. Just send me the name, ok? Sometime ago, when we were traveling in the US and visiting Thomas and Nancy in Ann Arbor, Michigan, Papa told me about a cuckoo clock that they had on their wall. He said a little wooden bird would come out of a little door on the clock each new hour and say “cuckoo-cuckoo.” So, I thought a cuckoo looked like that little wooden bird. 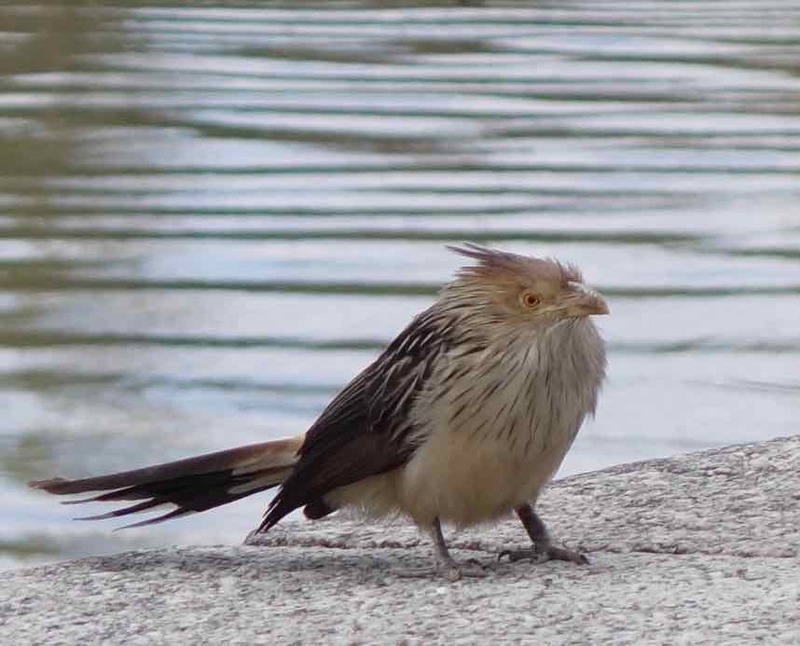 This is the real thing, a living, breathing Guira Cuckoo. I just love its tail. Never heard it say “cuckoo-cuckoo” though. I think that, when your mom was very little and visiting there with Nona and Papa, she grabbed the clock’s chain, pulled, and the clock came crashing to the floor, broke into many pieces never to work again. I’ve noticed that little kids in diapers seem prone to those kinds of accidents, and I’m sure it was an accident. Right? Anyway, this real cuckoo was in no danger from me. I don’t wear diapers, and it wasn’t stuck in a clock. I just liked looking at her. She isn’t really pretty like some other birds, but, still, she is attractive in some way. You don’t have to be pretty to be attractive and appealing, do you? Don’t get me wrong, though. I really like Buenos Aires. We can walk everywhere from our apartment on Avenida Guido. Imagine how good it feels to walk on our street under this archway of trees! We can walk to a big park, Costanera Sur. The park lies between the city and the wide river. It is a safe place for birds to live, so a lot of different birds come here to live. 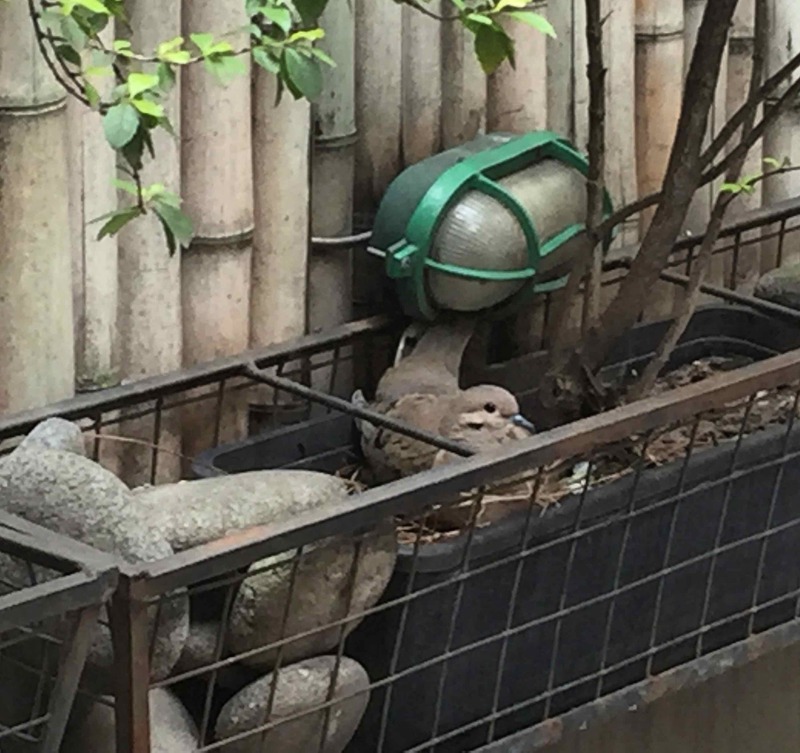 Our eared dove nests on our porch, and she has two little chicks underneath her. Sometimes she lets me see them, when Nona and Papa aren’t around. The eared dove is one of the most common residents here, but it’s not the most colorful. Its quiet, gray color makes me think of funerals rather than babies. Speaking of funerals, Buenos Aires must have a lot of funerals. 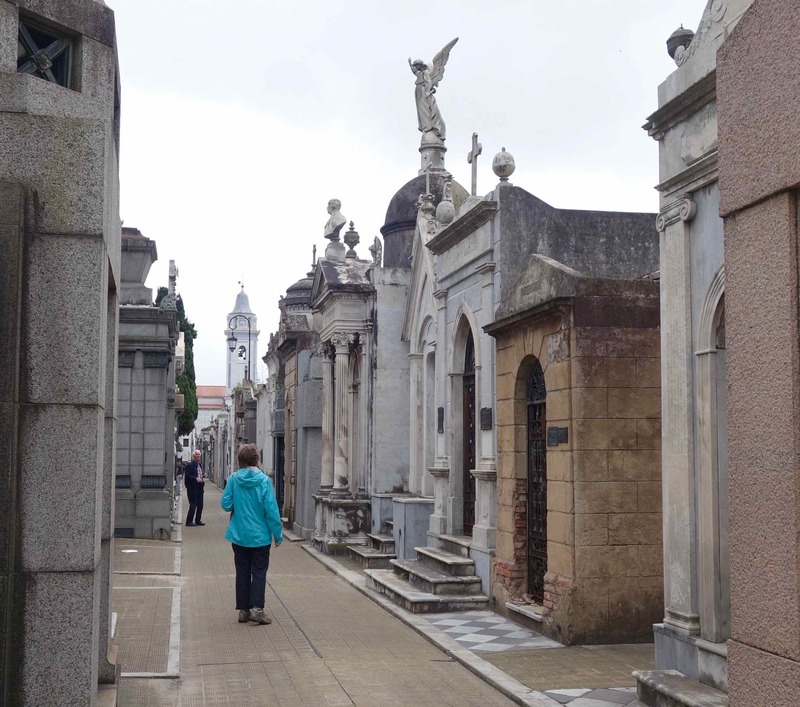 I know because we sometimes go for walks in a city that is built just for dead people, the Recoleta Cemetery. Yeah, they make houses, even mansions, for people who died. Whole families of dead people occupy the houses. Instead of clothes, the dead people are either put into urns or into wooden boxes called coffins. That’s ok because they are not going anywhere, and they don’t breathe anymore. I guess the dead people like to have us visitors walking around their little city, called a “necropolis.” A lot of people who are alive — like us — come here to look at these houses. We don’t just go to the cemetery. Buenos Aires also has a very nice art museum in our neighborhood. We like to walk over there to look at Argentinian art, as well as art from around the world . 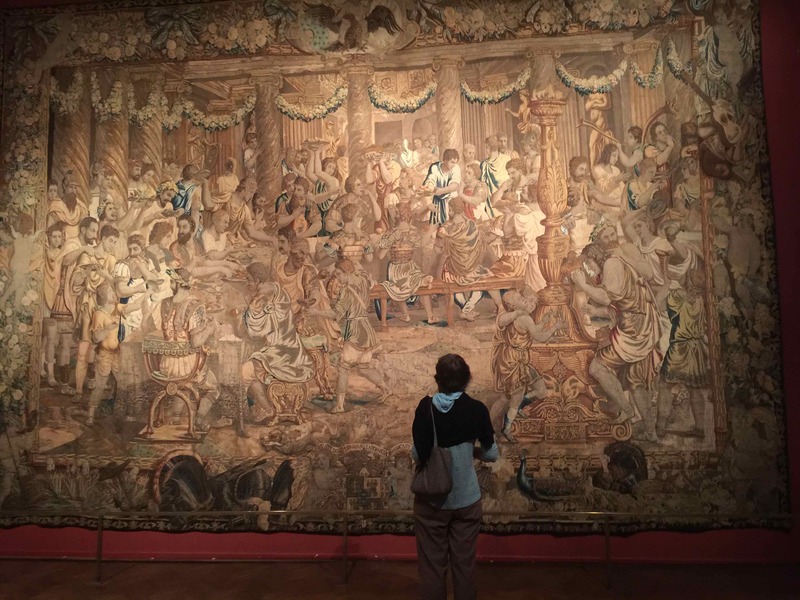 Nona said that this woven “painting” is called a “tapestry.” It is amazing that someone could “paint” such a big and detailed picture on a weaving loom. 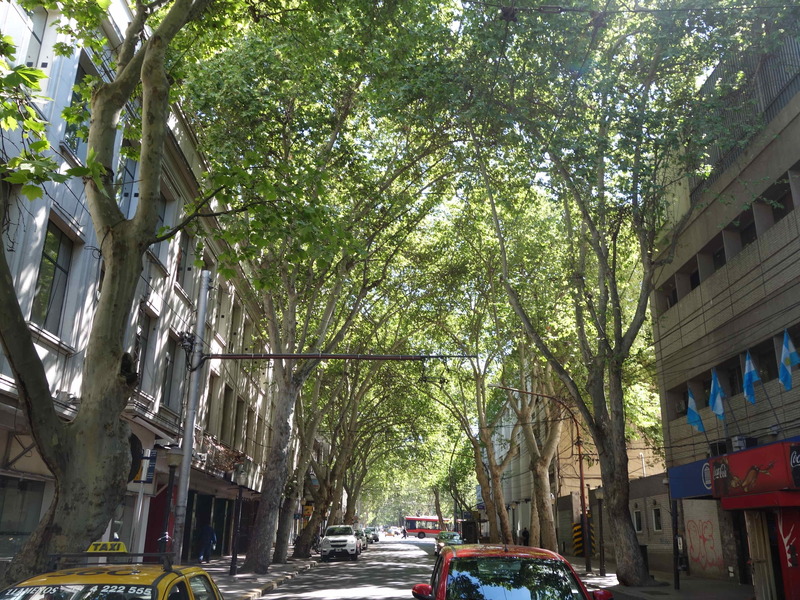 Well, that’s not everything that I could tell you about our neighborhood in Buenos Aires, but I’ve covered the basics from good air to bad air to life in nature to death in a cemetery to art in a museum. So, you see, our neighborhood — it’s called Recoleta — has it all and more. I take after Nona. She doesn’t drink tea, coffee, beer, or wine, and neither do I. Why? Nona just doesn’t like the taste of those drinks. 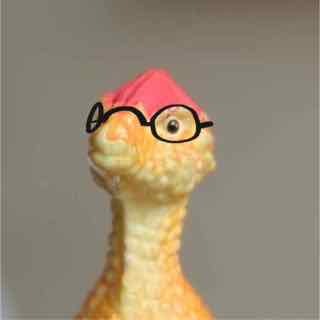 I’m a plastic Jurassic, and I’m pretty sure that we Jurassics never did drink those things. So I guess, in an odd way, we Jurassics and Nona have something in common, right? Of course, I’m not saying that Nona is an old fossil. On the other hand, there’s Papa. He likes tea and coffee, but coffee more and always black, no sugar. He likes beer and wine. In fact, he used to make his own beer, but he never tried making wine. So, when Nona found a tour of vintners (that means wine-makers) here in Mendoza, Papa was all for it. 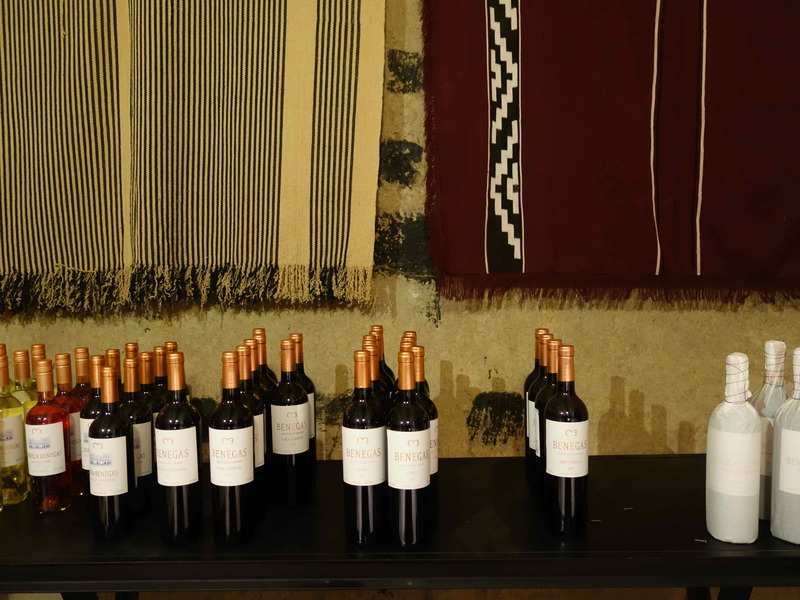 At our first Ampora Wine Tour stop, we saw old ponchos and new bottles of wine, symbols of two old traditions in Mendoza. We walked into the Benegas Winery. The collection of old ponchos on the wall reminded us that this region was cattle country with gauchos (cowboys), and those gauchos used ponchos. The collection of the different bottled wines told us that we were in a wine making region, too. I guess you could say the gauchos are becoming winemakers, or maybe winemakers are replacing gauchos, or maybe the region is big enough for production of both cattle and wine. It is a big region. You should have seen the smile on Papa’s face when he saw all those bottles of wine. He probably expected to drink a lot of that wine. Wooden barrels made from oak trees (those are the ones that make acorns for the squirrels to eat). 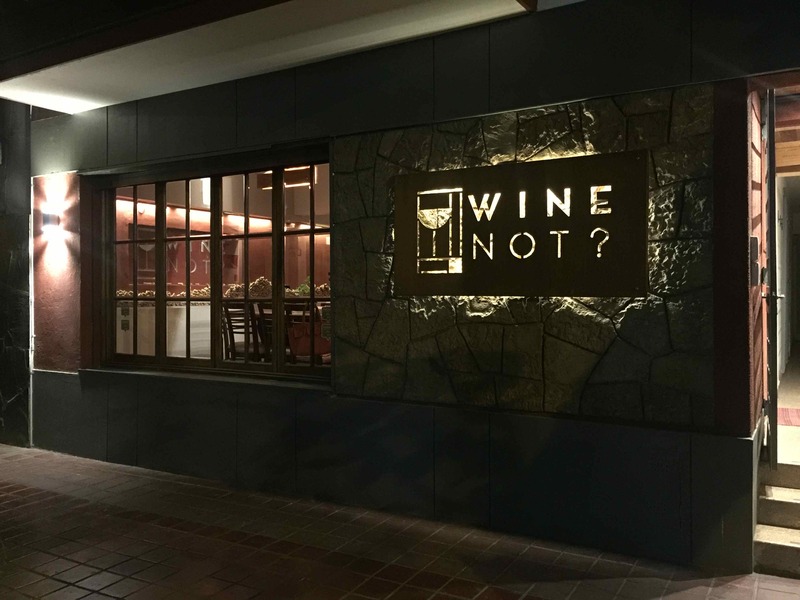 Why, I wondered, do they have barrels at this winemaking place? Did you know that wine doesn’t start out in bottles? I didn’t. I’ve only seen wine coming from bottles at home. Of course, Nona and Papa knew. Our really wonderful tour guide, Sabrina, explained that the wine starts out as grape juice. The winemaker puts a lot of juice into a barrel along with yeast. Yeast is a tiny creature that makes bread rise and ferments grape juice into alcohol. When I look at a spoonful of yeast, it just looks like powder. I wonder how can it do all that work? How does it know what to do? Amazing! 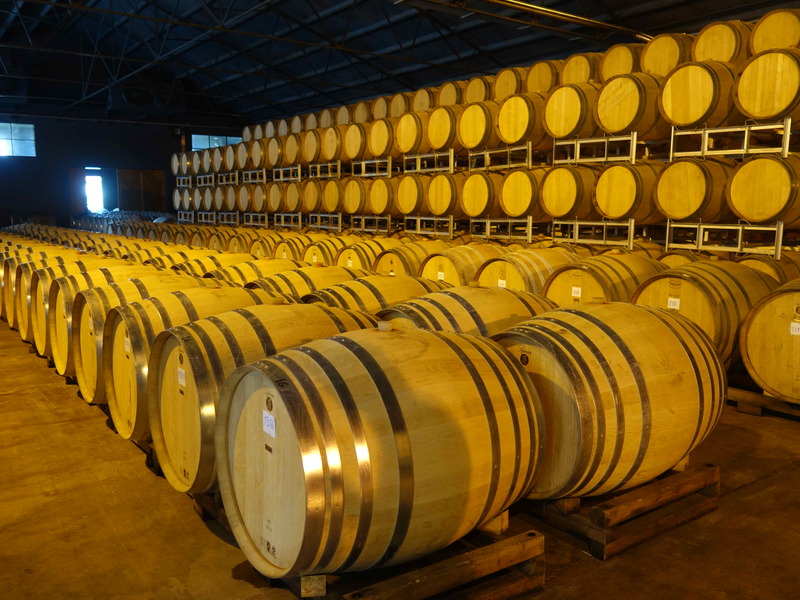 Well, also, maybe the oak barrel should get some credit too, because our guide said that the oak wood helps to flavor the wine. She also said something about a difference between American oak and French oak barrels, but I don’t remember about that. I guess French is better for wine. Speaking of getting credit for making the wine. Grapes deserve a lot of credit. Grapes provide the winemaker with the grape juice that is used to make the wine. Not just any grapes. Winemakers use different grapes for different tasting wines. Now about tasting wines on the tour that we took. Everybody got to have a wine glass and something called a “spittoon.” I learned that, when you taste wine, you don’t actually drink it. No, instead, you follow the 3-S rule: See, Smell, Sip. Papa would look at the wine, smell the wine, and then take a small sip to taste it. Then, he didn’t swallow the wine but spit it out into the spittoon – it looked like a little bucket! I think it should be called the 4-S rule: See, Smell, Sip, and Spit! On the other hand, I noticed that several people who were on our tour with us did not use their spittoons. I think maybe they were thirsty. Our tour took us to 4 wineries in one day. We had lunch at the last place. That’s when Papa actually drank some wine. Nona and I had tonic water, really good tonic water. 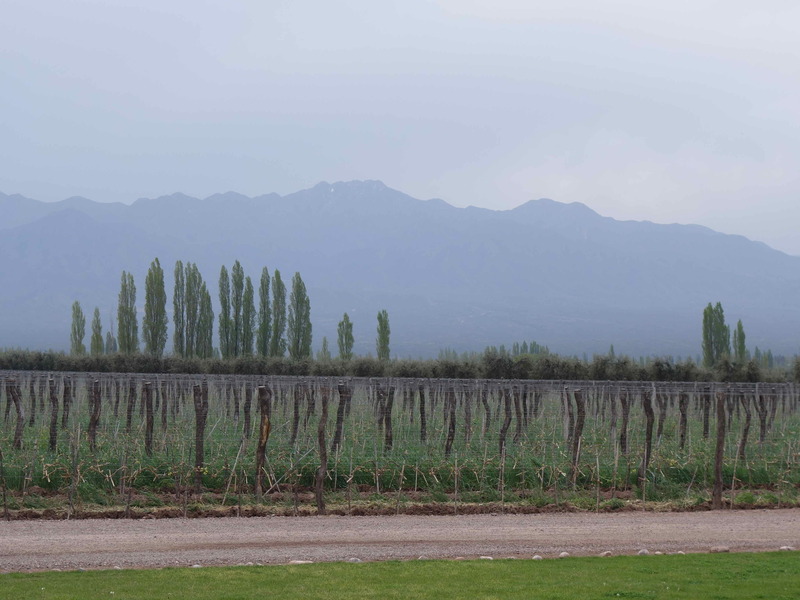 You don’t have to leave the town of Mendoza on a wine tour to taste wines. You can also go to a place like this in town. One evening, Nona, Papa, and I went to Wine Not to taste different wines. Well, Nona and I didn’t taste them. Papa did that, but Nona and I could do the 2-S’s: See and Smell. Even that was fun.